First released on iOS & Android, this addictive tile-matching game has made it’s way to the Nintendo Switch. I have spent the better part of today playing it and before I knew it, I had invested about 6 hours and realized that I had missed lunch. 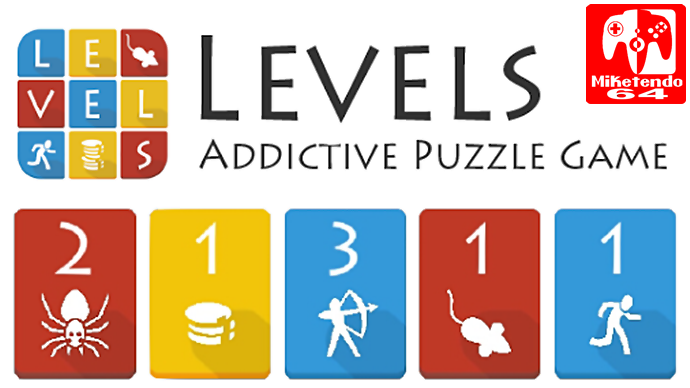 Levels+ is indeed very addictive and what makes it so is that it has a very simple plot: match up tiles to make blue tiles strong enough to take out the red tiles and match up the yellow tiles so you can collect them with the blue tiles to increase your score. The game starts off simple enough and most tiles are numbered between 1 and 2, as you progress and make the tiles stronger, the enemy tiles get stronger also and so you have to constantly level up your tiles as not to get blocked. There is no time limit so you can take as much time as you like which is very handy because there were times where you can get easily surrounded by enemy tiles that are stronger than yours and can stone wall you. I love the simplistic yet colourful design and the diferent images on the tiles do add a bit of variety. Though Levels+ is a time pit that you can sink many hours into, it is not without it’s Drawbacks. The Music starts off okay but as you get deeper into the game, the music begins to grate on your nerves. Fortunately you can turn the music off whenever you like and there is a separate setting for the sound effects as well. There is a tutorial if ever you forget the basics between sessions. A nice little extra is that you can earn power-ups if you are lucky enough to level up the gold tiles to Level 6 or above. One power-up is the lightning bolt which will eliminate all red tiles on the board. You can only use it once and will need to get another set of 6 or above yellow tiles for another chance. Another slight downside is that it is just one continuous game. There seems to be no end to the level which means you can only lose, the only comfort is the whether you got a good enough high score before your opponent blocks you in completely. On the plus side, once you start playing it, you won’t be putting it down for awhile until you lose even though you can continue where you left off at any time. Your natural instinct will have you keep going until either the battery dies or you lose. Now for the tough part, my conclusion and review score. I actually do enjoy playing Levels+ but as soon as you finally put it down it could be a while before you play it again and seems to be more ideal for binge playing rather than casual play. It is kind of like a can of Pringles, you don’t eat pringles every day but the day you decide to, you eat the whole lot and then may go a few days or weeks before you have them again. The music does great on your nerves after long sessions and a lack of a multiplayer which could totally work with this game, does hinder it’s potential somewhat. I would have preferred a few more game modes to add a bit of diversity to the game. Still, I shall graciously award this game with a fair 7/10. People who like these kind of games will no doubt enjoy it but it is a bit difficult to justify paying the price of $6.99 for a game you can play on your mobile for free (though it does come with in-game purchases). I will continue to play it because it is crazy addictive but I shall leave you to make your own opinions.